Get in touch with the life behind your favorite woodland. With 3D sounds! 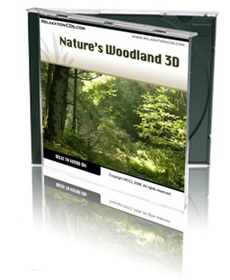 When the modern world gets just a little too much, get back to nature with this delightful CD. Close your eyes and you’ll imagine yourself deep in the woods. A gentle breeze rustles the leaves on the trees. Far above birds sing, while close at hand comes the occasional buzz of an insect. When you return from your woodland visit, you’ll feel relaxed and revitalized. Whatever life has in store for you, you’ll be ready and willing to meet it. And you’ll know that any time in future you need it, nature’s woodland will be here for you on this CD, to dissolve your cares and raise your spirits.